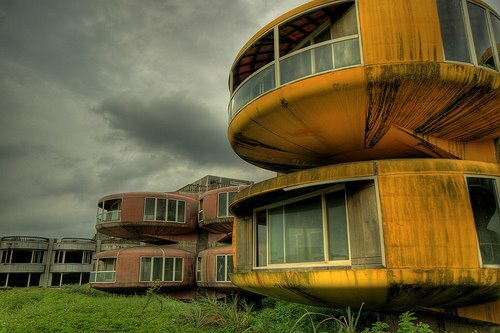 Check out an abandoned resort in Sanjhih on the north coast of Taiwan that locals call "UFO House." It has been abandoned for more than 20 years. Most likely the damage to the buildings has been caused by the strong winds of the summer typhoon season. Some people believe that it was abandoned because it's haunted. In some version of the story, someone died in an accident in one of the buildings. In another version of the story, it was abandoned because the government outlawed bathing beaches in this area, and the resort soon closed thereafter. Others guess that it was abandoned for practical reasons. The resort is in a remote location between the sea and a major road going to northern Taiwan (and it can get incredibly windy in that area along the coast). It also could have been because of problems with the design - either with the quality of the materials or with living conditions inside the pods. If they are fiberglass, it would get overwhelmingly hot inside the pods in the summer.